The times when the beams on the ceiling were exclusively in rural houses are already long gone. 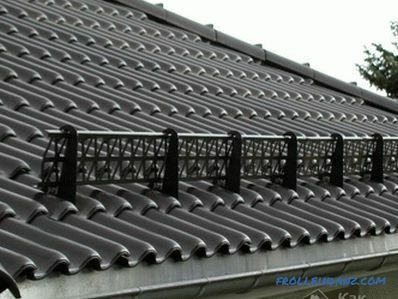 In addition, it is worth noting that today they perform not only the role of support for the roof, but also a decorative function. 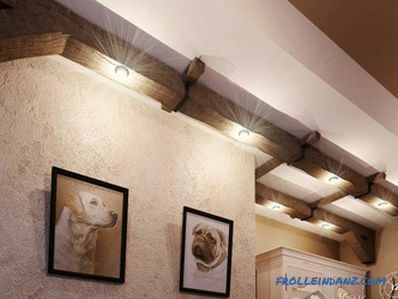 It is because of the latter that many prefer to install decorative beams, not only in country houses, but also in city apartments. They will look original and unusual, but only if they are properly beaten. 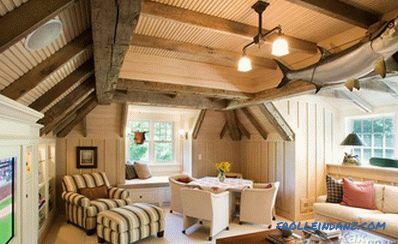 It is about how to beat the beams on the ceiling in the apartment and the old house, we will tell in this article. 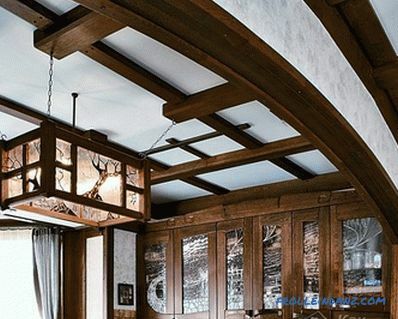 Wooden beams for the ceiling are a classic option. They are made of ash, pine and oak. 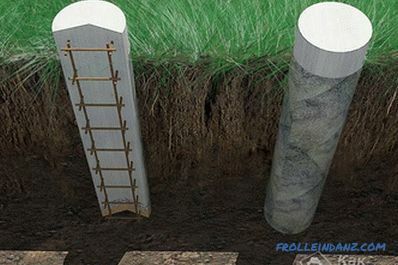 They can be solid or hollow inside, which will hide various communications. can be mounted on the beams fix lamps or chandeliers with chains. When planning the interior, it is necessary to pay attention to all details, even the most insignificant. When it comes to beams, there are several options: beat the entire surface, or draw it partially, making a strict structure. Laying beams can be a variety of ways, while relying on your taste and discretion, so do not limit yourself to the rules. Brushing. 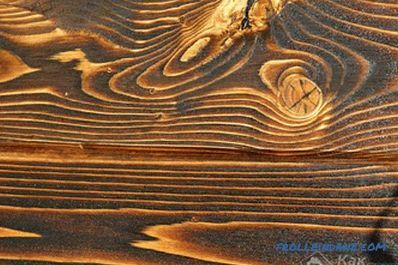 This technology will highlight the texture of wood. Masters imitate even traces of the bark beetle. As a result, the beams are transformed beyond recognition, and the impression that the tenants are located in an old house that is more than 200 years old will appear. Fire treatment. 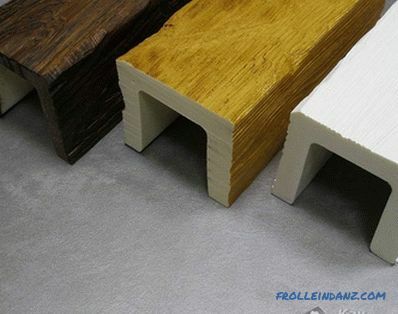 This is a technology of artificial aging of wood. 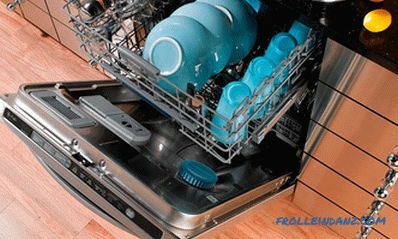 For this method you will need a blowtorch and special brushes. Vintage style. 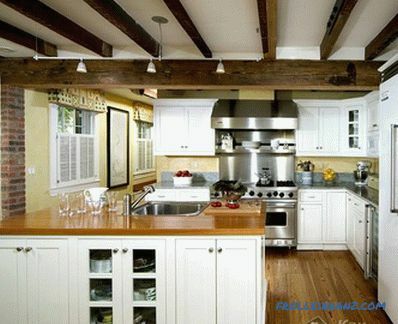 To ensure that the ceiling with bearing beams looked like an old one, you can use special paints and varnishes. Ethnic style. It is necessary to include forged elements and twine in the interior. Traditional style. A distinctive feature - simplicity, this is what allows you to create an atmosphere of comfort and warmth. Some designs involve transitions from ceilings to walls . 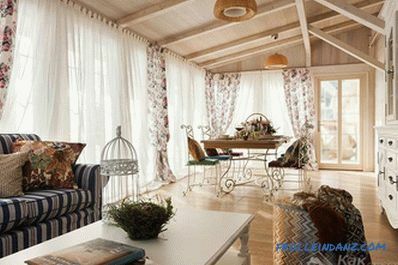 In this case, the beams will be able to give a refined European-style room. not easy to paint beams, but also apply them painted by hand or with stencils. 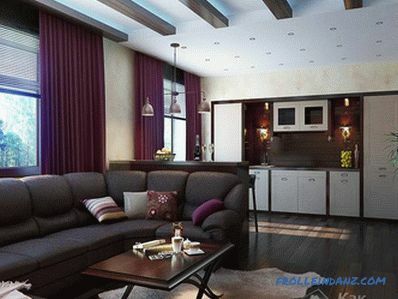 There are also a few recommendations regarding the style of the interior room. For example, high-tech style goes well with metallic shades, originality will be added by wires that do not hide, and simple light bulbs for lighting. 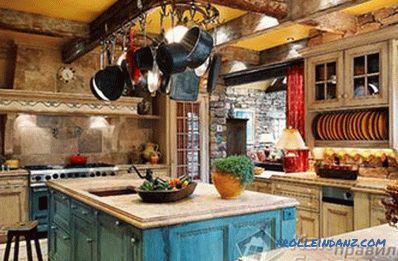 If we talk about the style of country or Provence, then the whitewashed ceiling on the background of bright beams would be most appropriate. 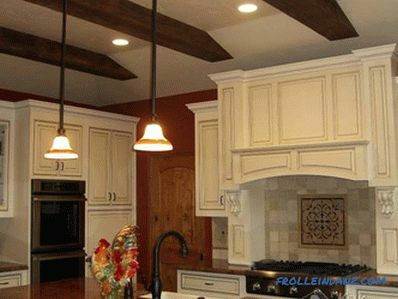 When painting beams, it is not necessary to give preference to natural (brown) and pastel shades. By choosing bright colors, you can get a bright accent on the ceiling. 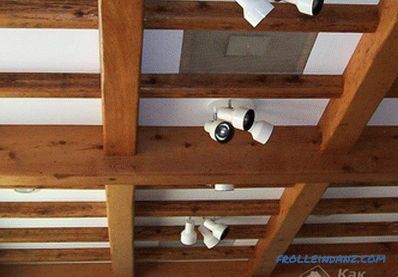 Now let's look at the basic methods of how to beat beams on the ceiling in a house in different situations. 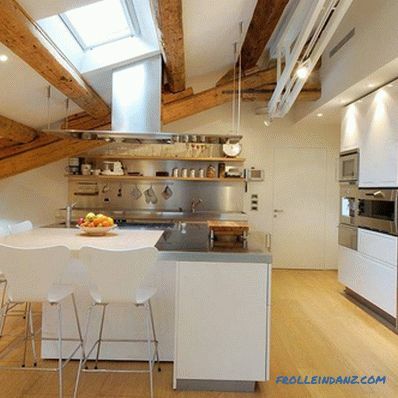 Used for hanging dishes Beams in the kitchen. In this case, you can proceed as follows: the beams are lowered below the ceiling level and fixed in a stationary state. Hooks are fixed on the structure, on which it is possible to hang dishes, kitchen utensils, products (garlic, onion or bitter pepper), fragrant herbs, dried flowers and much more. Especially good it will look in a house with high ceilings. Fixing the hanging chair If the beam is in good condition, then the hanging chair or swing can be attached to it. They fit perfectly into the interior of the living room. It is important to remember that when it comes to imitation, then this option is unacceptable. Beams with spotlights Lighting system. In this case, place the lamps, made under the old days, for example, the chandelier in the form of a wheel with lights in the form of candles will look original in the large hall of the chandelier. 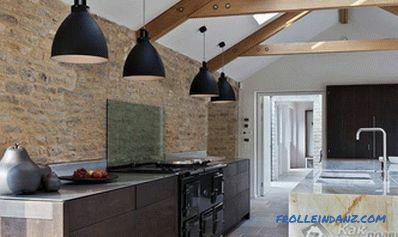 You can also abandon the central light source and use spotlights, which are mounted on all beams or through one. 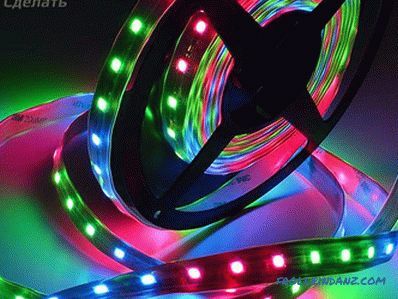 LED strip. This is a chic and modern option. LED strips are mounted at the junction of the beam and ceiling to make them less noticeable. Thus, you can get the effect of a ceiling soaring in the air. False beams. When one or more elements have lost their attractiveness, and their structure is completely destroyed, you can replace them with cheaper analogues of polyurethane. They imitate wood structure well. Textiles. 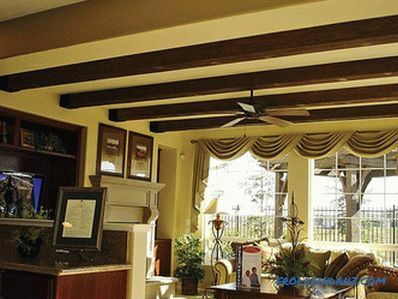 When it comes to the design of the ceiling in the bedroom, the beams can be used to form a canopy. Here are the most common options: cornice, rings and ropes. 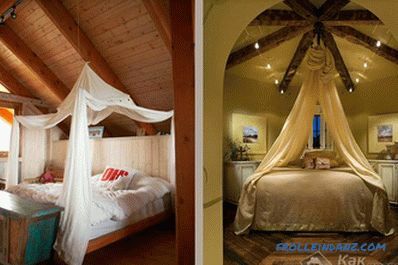 The material can be hung in a chaotic manner or according to a planned pattern, for example, around the bed. This way will add feelings of lightness, weightlessness and romance. Rope decoration. If other options cannot be done, then decorative ropes can be fastened along the contour of the concrete beam. The LED mounting option is suitable for modern style or for a teenager's room. 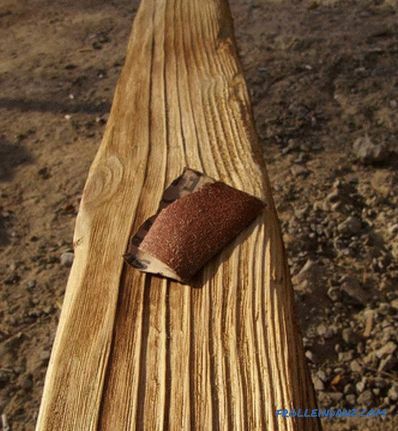 What if the concrete beam cannot be disguised? 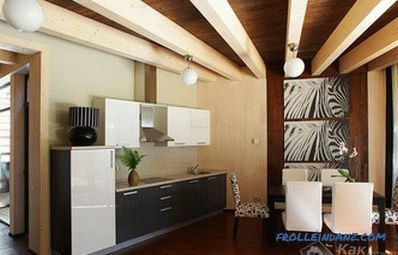 In this case, you should make a suspended structure of drywall or stretch ceiling. You can make a box in the shape of the letter “P” from drywall. Fix this box directly to the ceiling and adjacent wall. 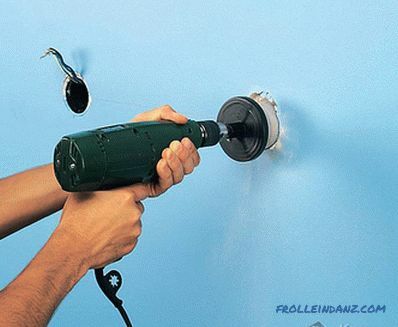 It is not recommended to drill into the beam, as it may lose its technical characteristics. Moreover, if a concrete beam is located vertically, then this disadvantage can be turned into an advantage. For example, make a built-in wardrobe. This will completely hide the existing beam and at the same time a lot of storage space will appear. 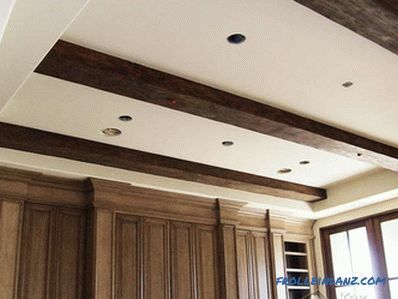 Using partial masking, you can hide flaws and defects on the ceiling and leave beams in the interior of the room. 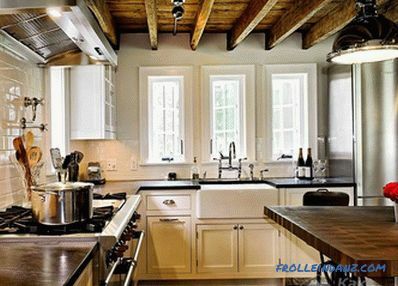 If your house has ceiling beams, then getting rid of them will be the worst solution. After all, it is possible with the minimum financial and time costs to make a highlight in the interior of the room, just correctly beating the existing design features.